Leaders and Partners’ Conference – a two-day conference, hosted by Believers LoveWorld President – Chris Oyakhilome, will take place on July 14th and 15th. 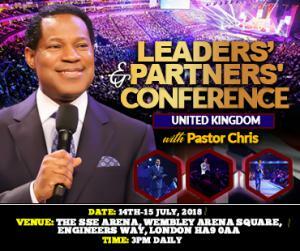 LONDON, LONDON, UK, July 13, 2018 /EINPresswire.com/ -- Leaders and Partners’ Conference – a special two-day closed-door conference, hosted by Believers LoveWorld President – Rev Dr. Chris Oyakhilome, will take place on July 14th and 15th of 2018 at the SSE Arena in Wembley, London. The event is expected to start at 3PM local time in each one of the days. The conference has invited leaders and partners of the ministry from all over the world, including from countries in North America and Africa. The two-day event is expected to welcome thousands of leaders and partners and fill out the stadium. They will have the opportunity to witness a fellowship with the word of God through a ministry of Pastor Chris Oyakhilome, also known as “the man of God”, during the two days that he will minister. “On the 14th and the 15th of the month of July, we would be in London for a very special conference for leaders and partners. If you’ve never been a partner, it’s time to be a partner with us in ministry. We are taking this thing to another whole new level by the power of the Holy Ghost”. The organization shares that The Leaders and Partners’ Conference in the United Kingdom will be the first of many programs with Pastor Chris Oyakhilome of Christ Embassy that will occur in the second half of the year. Previously, the pastor declared 2018 as “The Year of the Supernatural”. And that’s why I’m coming to London to share the word of God with you that would just catapult you to a new pedestal of faith and operation in the spirit for the things that God is calling you up to", Pastor Chris Oyakhilome says regarding the upcoming conference.